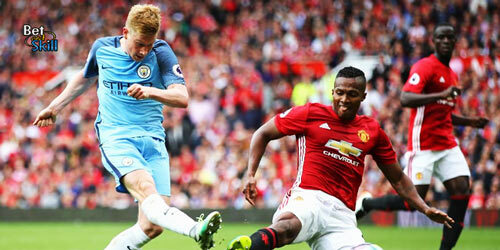 Manchester United visit the Etihad Stadium on Saturday for a most anticipated derby, as Manchester City will secure the Premier League title if they beat the Red Devils. This post contains our Man City vs Man UTD betting preview with predictions, betting tips, probable lineups, team news, enhanced odds, exclusive betting offers and no deposit free bets on the Manchester Derby! Get 25/1 Manchester City or 50/1 Man UTD to win at Betfair! New Customers can get Man City at an enhanced 25/1 to beat Man Utd or Man Utd 50/1 to beat Man City. Max Stake £1. Winnings paid in free bets, valid for 7 days, only deposits with cards/Paypal count. Exchange and multiple bets excluded. T&C’s Apply. 18+|Gamble Aware. Manchester City beat 3-1 Everton at Goodison Park in Saturday's late kick-off and they can be crowned champions as early as Gameweek 33, having a 16 point commanding lead over United in the Premier League table. Pep Guardiola's men sufferd a chastening defeat in Champions League against Liverpool at Anfield Road in midweek and Tuesday's return match could be a potential distraction. Their home form is impossible to ignore, having won 14 in a row in front of their own fans in Premier League. The Citizens run out 2-1 winners at Old Trafford in December’s reverse fixture, while they shared a 0-0 draw when they met on this ground last season. Sergio Aguero will push for a return after missing City's last four matches with a knee injury but Gabriel Jesus is expected to lead the line once again. Raheem Sterling and one between Bernardo Silva and Leroy Sanè will flank the Brazilian upfront. In midfield, Ilkay Gundogan offers an alternative to David Silva or Kevin De Bruyne while Fernandinho should retain his berth. Fabian Delph could be handed a start at left-back, with Kyle Walker as right back. John Stones is an option to start in central defence should Pep Guardiola look to rotate and rest Vincent Kompany ahead of the Liverpool encounter. Benjamin Mendy is the only long-term absentee. Manchester UTD will be looking to avenge the 2-1 defeat against City at Old Trafford back in December and further consolidate second place in the Premier League. The Red Devils beat Swansea last time out to make it four wins on the bounce and eight victories in their last 10 in the Premier League, but they have lost two of their last three games away from home. United have failed to score in three of their four away league matches against their top-six rivals this season. This will be a clash between the best defences in the Premier League this season, with United conceding 23 goals and City just 21 in 31 games so far. Jose Mourinho may consider switching from a 4-2-3-1 formation to a 4-3-3, allowing Ander Herrera to start in midfield alongside Paul Pogba and Nemanja Matic, with Scott McTominay and Marouane Fellaini the other alternatives in the middle of the park. Up front, Alexis Sanchez and Jesse Lingard should partner Romelu Lukaku, while Marcus Rashford and Anthony Martial look set to be named among the substitutes once more. At the back, Phil Jones could return in central defence, with Chris Smalling’s start at risk. Eric Bailly, ANtonio Valencia and Ashley Young should all continue to feature from the off. Sergio Romero and Daley Blind are Manchester United's only injury concerns. 25/1 A Yellow Card in Man City v Man UTD! Coral offer 25/1 ANY Yellow Card to be shown in Man City vs Manchester UTD in Premier League + £5 free bet! Get 25/1 Man City to win the Manchester Derby with Paddy Power! Customers can get Manchester City at an enhanced 25/1 to beat Man UTD. Max Stake £1. Winnings paid in free bets, valid for 7 days, only deposits with cards/Paypal count. Exchange and multiple bets excluded. T&C’s Apply. 18+|Gamble Aware. Get 50/1 Man UTD to win the Manchester Derby with Paddy Power! Customers can get Man UTD at an enhanced 50/1 to beat Man City. Max Stake £1. Winnings paid in free bets, valid for 7 days, only deposits with cards/Paypal count. Exchange and multiple bets excluded. T&C’s Apply. 18+|Gamble Aware. Smarter bettors are always looking for the best odds in order to have maximum profits and BetAndSkill compare odds from the top 70 online bookmakers. Find below the best price on the MANCHESTER CITY vs MANCHESTER UTD match winner! Take also a look at our odds comparison table and enhanced odds sections! Our team have deeply analysed all the betting factors that could influence this Manchester Derby. This section contains our expert betting tips on Man City vs Man UTD. You can back them at the reported price by clicking the 'Bet' button. And don't forget you can use the cash-out feature to guarantee you a profit. Find here all the cash-out betting sites. Looking for more Premier League match previews? Visit our amazing Premier League free tips section! 25/1 ANY GOAL in Man City v Man UTD! Ladbrokes offer 25/1 a GOAL to be scored in Manchester City v Man UTD + £5 free bet! "Man City vs Man UTD betting tips, predictions, lineups and free bets (Premier League - 7.4.2018)"